Starting your own art program for the elderly does not necessarily require a formal art therapy degree. Understanding what works, combined with a love of creativity, and a desire to care for people from all walks of life are the only prerequisites for helping the elderly express their unique personhood through artistic self-expression. Written from a lay person's point of view, this e-book is a practical guide on how to take your art teaching ideas into the seniors' real world. Generously illustrated with photos, "How to Start an Art Program for the Elderly" shows the wide range of self-expression that can be encouraged. This practical 45-page e-book takes you inside Canada's largest art studio for the elderly, and describes what is artistically possible. It details the pros and cons of offering art projects that are structured and instructor assisted, as well as the results of offering spontaneous art projects that are more art-therapy based. Beyond theory, this e-book provides examples of art projects that have worked in care homes and community art programs for the elderly. If you wish to engage the cognitively-well elderly, or are working with those with dementia, you will see the depth and stamina of creativity that is possible near the end of life. If you work with seniors with dementia, you will find that creativity and dementia can be an inspiring mix: when the cognition of self-censorship fades, the creative expression that results is often original, enlivening, and delightfully surprising! "Thanks so much for all of this information! ... I've just started on this journey and have SO much more research and learning to do, but I feel like a new door has opened, and I appreciate you sharing your experiences in this book." - S.S, La Crosse, Wisconsin, USA This e-book was originally presented as a published booklet for the 2010 Conference for The Society for the Arts in Dementia Care. Shelley Klammer is an expressive artist and a therapeutic art instructor in the Artworks Studio at George Derby Centre in Burnaby, BC. She works with a team of 8 instructors to maintain a large working art studio that provides projects in painting, textiles, weaving to seniors with varying levels of dementia and physical challenges. 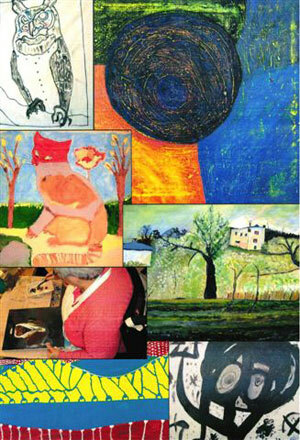 Shelley has developed and presented many therapeutic art programs over the years to various populations. Her intuitive group approach is grounded in the direct experience of engaging many types of people in the art-making process. Shelley has developed art programs for incarcerated youth, adults with acquired brain injuries and developmental disabilities, seniors with Alzheimer’s and dementia, and with children and the general public. If you would like to submit a review of this product, send it to our contact address and we will post the information here.